Logline: Showing the experiences and humanity of those with NF2. Premiered and Displayed at the Queens Museum exhibit I Curated. I Directed, Edited, Wrote, D.P. All special effects done in camera. 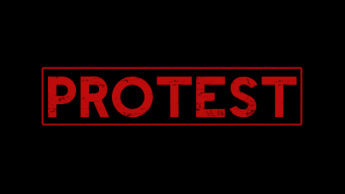 PROTEST is a feature-length mockumentary about student activists that was filmed predominantly at Binghamton University during the 2011-2012 school year. It premiered on May 10th 2012 at BU where it was promptly protested. Header Logo is a Tilt shift image that I, along with my camera assistant Ari Greenberg, took from Binghamton University Library Tower.